The relationship between businesses and smart cities is mutually reinforcing, opening doors to new possibilities only achievable under one harmonious environment. In being better connected to their surroundings, businesses - so often the service providers of smarter cities - will not only understand the landscape in which they operate in better, but also the people that inhabit them, offering more advanced technologies and solutions to citizens directly through a city’s infrastructure. 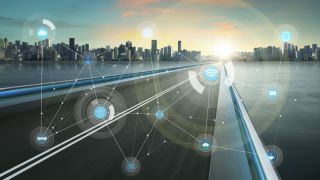 The pervasiveness of connected devices and mobile networks in recent years has seen data’s footprint expand exponentially. With the likes of 5G networks being introduced as early as next year, this is only set to increase. And yet, while human and machine generated data is exploding, the richness is typically hidden due to the volume, velocity, and variety of it. That is why we need to look at the common element across all data sources - location. Overlaying artificial intelligence and machine learning to such a platform - and then opening it up to developers and city planners alike - will speed up the pace of innovation and see inhabitants benefit from the seamless experiences within this smart city. From the optimisation of rail lines and roads, to the efficient delivery of packages and the provision of more intuitive public services, smart cities can only prosper through collaborative networks. So often with stories dominated by technology, it’s the human element where the real potential lies. Understanding the people behind our cities, from their daily travels through to their challenges in an increasingly crowded metropolis, will, over time, allow businesses to offer more informed solutions to those very same people. Businesses possess the resources and talent to develop the technologies that can change lives. And when the autonomous future does arrive, different businesses must combine their resources to ensure vehicles, drones and people interact safely and intuitively. Simply put - while location has always defined the city, it’s location data that will ensure smart cities becomes a viable reality.